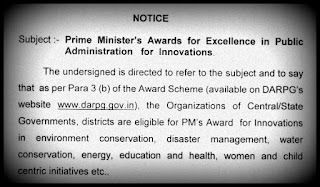 babus of india: How and where to apply for PM’s Awards for Excellence next year; ...and what about the award on innovation? How and where to apply for PM’s Awards for Excellence next year; ...and what about the award on innovation? January 1, 2017 and it can be done only through online. The proforma of application will be made available online in due course, the clarification notice issued last week by the department of administrative reforms and public grievances (DARPG), said. “It is to clarify that notification for registration by the concerned office for awards in innovation will be issued separately,” the government note further said. 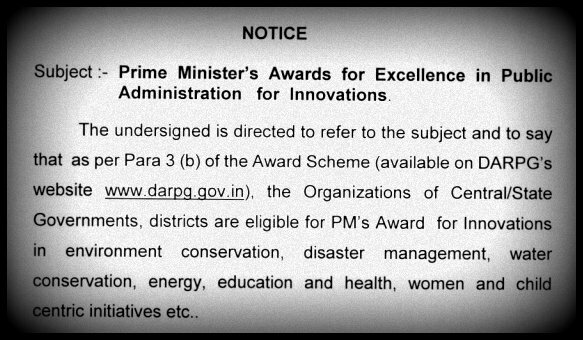 Meanwhile, the DARPG has developed a portal for PM Awards for Excellence in Public Administration, and the link has been made available on website of DARPG. Each district including those who have already intimated the chosen priority programme, is required to register on the portal. The application process shall start in January 2017.
e) e-National Agriculture Market (National e-Mandi). The awards to the selected districts and organizations will be presented on the next civil services day i.e. April 21, 2017. BoI has recommended to its readers to visit the official website of DARPG to get all the details in the run-up to the PM’s Awards for Excellence next year.